Art therapy is a form of health therapy that is an alternative to traditional therapy using verbal communication. 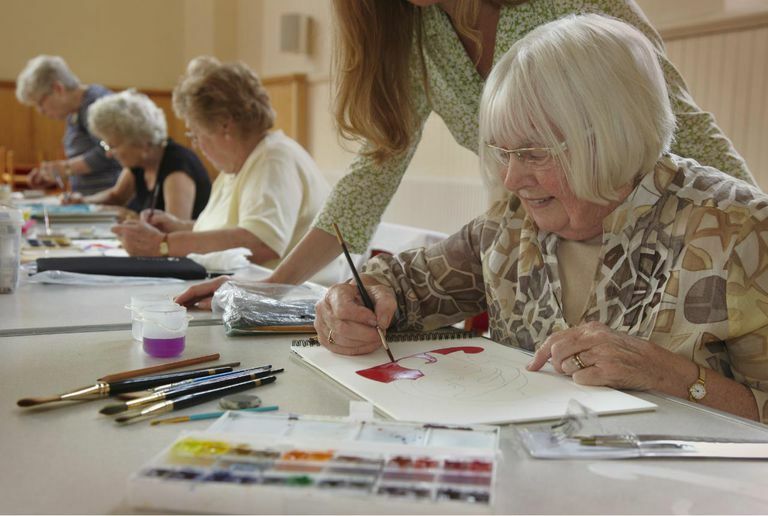 Art therapy focuses more on using art and art-creating processes as therapeutic interventions. Art is used as a form of psychotherapy much like verbal psychotherapy. Therapists have clients create art, and then interpret the symbolic expression communicated in the artwork. Art therapy is similar to other mental health therapy approaches including Cognitive Behavioral Health Therapy, Gestalt Therapy, Adlerian Therapy and Person-Centered health therapy. The basic tenets of art therapy rely on creativity, reconciling a client's emotional or psychological conflicts and creating personal growth through increased self-awareness. Art therapy can help patients reconcile feelings of sadness, anger, guilt or self-destructive tendencies. The American Art Therapy Association supports the broad use of art therapy to help clients establish greater degrees of self-nurturance and healing. Compassion. The goal of art therapy is to teach clients self-nurturing skills. Art therapists have to be compassionate and empathic toward the clients and patients interested in art therapy. Creativity. Art therapists use many different perspectives and types of art to help patients recover. Therapists must use innovative and creative techniques to realize success in this field. Relationship-Builders. Art therapists work with many community agencies including community health centers, youth centers, and senior centers. To succeed as an art therapist it is critical that you build warm and caring relationships with the patients you treat and the communities that serve them. To practice as an art therapist you will need a master's degree in art therapy. Some states may require licensing and other credentials depending on each state's regulations. The American Art Therapy Association provides more information about credentialing and the Education Committee of the Association. You can find universities and colleges on this website that offer accredited art therapy programs. An art therapist may work with schools, in nursing homes, in rehabilitative facilities or as part of a private practice. The Bureau of Labor Statistics reports that art and recreation therapists make an average mean salary of between $32,350 and $44,280 as of May 2012 per year. Art therapy is a good career to embark on. The employment outlook for art therapists is expected to grow as fast as average as or faster than average through 2020. New discoveries in art therapy have created outstanding opportunities for art therapists to practice in new environments and treat patients with diverse conditions. As the benefits of art therapy continue to be discovered it is likely more opportunities will about for art therapists to practice and for individuals to explore careers in art therapy as a form of health therapy rehabilitation. Bureau of Labor Statistics, U.S. Department of Labor, Occupational Outlook Handbook 2012 Edition, Recreation Therapists, on the Internet at http://www.bls.gov/ooh/healthcare/recreational-therapists.htm (visited 5/13/2013).